My first experience with competing commitments was in my master’s program at JFK University. I took a class called The Challenge of Change that explored barriers to change and techniques to move beyond those barriers and achieve success. A competing commitment is an underlying fear or undesirable outcome that can accompany any change you want to make (even a positive one). When you harbor a competing commitment, your mind invokes what’s called your ’emotional immune system’, which like your physical immune system, fights off unwanted invaders. In this case, change is the illness and your competing commitment is the cure. Here’s the kicker: Even positive change can come with a downside. You may unconsciously believe there are trade-offs you are not willing to accept if you reach your goals. It works like this: You have a stated goal, and you believe you are striving full speed toward that goal, but you undermine the outcome in subtle ways that you are usually unaware of. Your Big Assumptions: What you assume will happen if you reach your goal. This is what feeds your competing commitment. Stated Goal: What goals are you and others aware of? What are you consciously working on right now? Your actions: What specific behaviors and actions (or non-actions) are you taking that undermine your efforts to reach the goal? 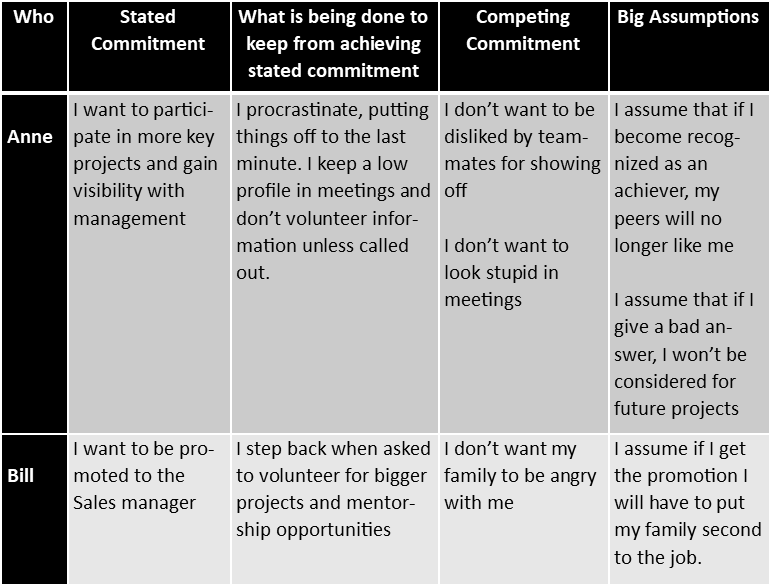 Your competing commitment: Take your time to think this through. What do you visualize happening (good and bad) once the goal is achieved? Will you be required to do more work? Do you worry you won’t have the skills to maintain your success? What impacts do you fear in personal and peer relationships? What else comes up for you when you visualize your life after achieving your goal? If it feels true on a gut level, write it down. Be kind to yourself: We all have competing commitments on some level. You are not damaged goods – and you are not a failure for having underlying conflict. The fact that you want to face your competing commitments shows you are determined to succeed, even if the process isn’t easy. Learn to live with your competing commitments: Competing commitments don’t magically disappear once acknowledged. Many big assumptions are rooted in years of life experience and may even stem from childhood. The key is becoming aware of your competing commitments. This allows you to recognize behaviors that undermine your success and allows an opportunity to pivot into a new behavior or way of seeing your goals. Talk it out: If your Big Assumptions involve friends, family members, or work peers, it can be helpful to discuss these with them. In many cases, you’ll discover others have no idea how you feel. They can help debunk assumptions, or brainstorm ways to deal with your concerns as you move toward your goal. Sharing your concerns can alleviate a great deal of stress. Another alternative is to work with a coach who can help you stay on track and add a layer of accountability. Create your action plan: Write your goal. Then break down steps you need to take to move toward the goal. 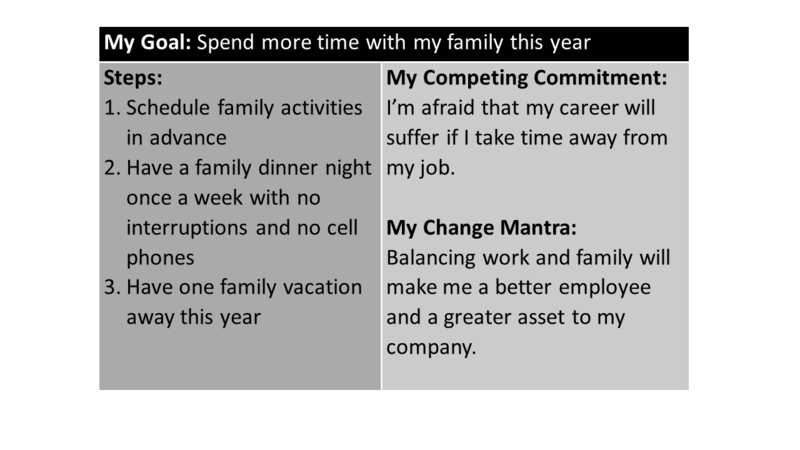 Next to your steps, write your competing commitment, then write a “change mantra” beneath your competing commitment. Use your action plan to keep focused on your goals. If you feel like you’re stuck on the road to success, examine your thoughts and actions. If they aren’t in alignment, you may be dealing with an underlying competing commitment that is subconsciously holding you back. Try the steps above to get unstuck and back on the path toward your goals. The journey requires conscious hard work, but the reward is worth the effort.